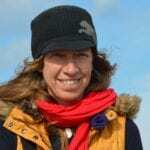 Christine Ruth Handte is a Director of the Institute of Ecotechnics (UK/USA) and a Director of Ecotechnics Maritime (UK). She was elected a Fellow of the Institute of Ecotechnics (I.E.) for her work with the Research Vessel Heraclitus and is a member of the Explorers Club. She joined the crew of the R/V Heraclitus in 1986 and has made Heraclitus and its ecological, cultural, theater and artistic projects the focus of her life. Her first expedition was the “Around the Tropic World Expedition” from Corsica to San Juan, Puerto Rico. Christine conducted a wild dolphin study around Warsaw Island, Georgia as part of the first successful release of previously captive dolphins, a project of Heraclitus and the ORCA Foundation. She managed cetacean studies during the ship’s 1987-1989 ‘Circumnavigation of South America’. In 1989, Christine was a key member of the team that successfully raised and restored the ship which was sunk in San Juan harbor during Hurricane Hugo, including salvaging the 1,000 book onboard library. Christine was captain of the Heraclitus from 1990-1995, concentrating on coral reef and mangrove studies in Belize and elsewhere in the Caribbean, assisting in coral and fish collections for the ground-breaking Biosphere 2 project in Arizona. She was Expedition Chief and Chief Administrative Officer of the Planetary Coral Reef Foundation (PCRF) during the Indian Ocean and Southeast Asian archipelago coral reef health and vitality studies aboard the Heraclitus. From 2000-2003, she served as the Education Officer for the October Gallery in London doing school and public outreach for a gallery which showcases cutting edge artists from around the world. She initiated and coordinated exhibitions showcasing art and photography of Heraclitus Expeditions for galleries in London, Berlin and Singapore. She rejoined the Heraclitus for its longest continuous voyage, 4.5 months, across the North Pacific in 2003. Since 2006, Christine has again served as Heraclitus’ Expedition Chief. Recent expeditions have included the Coral Sea to Mediterranean Sea, and Lives and Legends of the Mediterranean Sea’ oral history project documenting sea peoples, in cooperation with the Ethnological Museum of Valencia, Spain and the port office of Marseille, France. She has directed and performed in over 30 theater productions of the onboard “Blue Planet Ensemble” in ports around the world. Fluent in German, English and Spanish, she has also traveled extensively in China, Tibet, Australia, Indonesia, Iran, South America and the United States. Currently, she and the Captain are co-directing the complete rebuild of the R/V Heraclitus in Roses, Spain, and will serve as Expedition Chief during its 2020-2025 Sea People Expedition to West Africa, Brazil and the Caribbean.